All Pilgrimages are NOT created equal! “One of the priests I used to work with at school traveled to Israel a few years ago with _____________ [I am leaving travel company’s name out]. “He told me they went to 5-6 stores, He said, ‘We spent more time in the stores than at the holy sites.’ He also said it was disorganized and they were constantly with their hands in their pockets for tipping everyone. "In my opinion this is NOT acceptable on any trip." 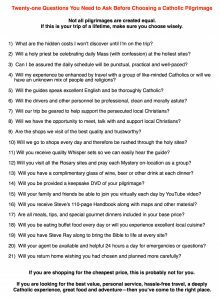 In response, I came up with TWENTY-ONE QUESTIONS TO ASK BEFORE GOING ON A PILGRIMAGE.